"Has a long reach, but seldom deals critical blows." Lock the Keyhole in Deep Jungle. The Jungle King is a Keychain for Sora's Keyblade which appears in Kingdom Hearts. Tarzan gives Sora the Jungle King once he locks Deep Jungle's Keyhole. The Jungle King was originally planned to appear as the signature Attack Card for Deep Jungle in Kingdom Hearts Chain of Memories, and was even depicted in early screenshots for the game, but was removed along with the world when the estate of Edgar Rice Burroughs forbade Disney from reusing Tarzan. The Jungle King appears to be made of wood and other materials from nature. Its handle is orange and surrounded by a circular, tan guard with two spikes near its top. The guard is almost entirely covered by a dark purple material wrapped around it. 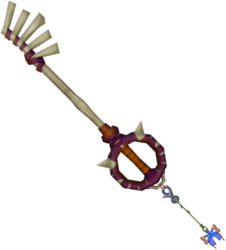 The shaft is very thin, tan, and long, to the point that the Jungle King is one of the longest Keyblades in Kingdom Hearts. Its teeth are made of five blunt, tan spikes separated by the same dark purple material from the guard. The first link of the Keychain appears to be a silver carabiner, while the rest of the Keychain appears to be a strand of creeper vine. The token resembles a blue butterfly with orange wingtips, the same type of butterfly that covered Deep Jungle's Keyhole. The Jungle King's English name references Tarzan's position as the "ruler" of Deep Jungle. Its Japanese name, Native Work, alludes to its status as a creation of the jungle. The Jungle King appears as an "Items" Avatar Part in Kingdom Hearts Re:coded. This page was last edited on 5 April 2019, at 14:38.